We are one of the leading service providers of Leaflet Insertion Services. The offered leaflet insertion services are carried out for inserting the leaflets in newspapers and magazines. Our offered leaflet insertion services are delivered by the most experienced technicians of the domain. 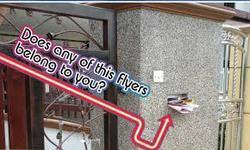 The offered leaflet insertion services are available at very competitive market rates. We, Parth Enterprises, got established in the year 2015, as a service provider of Advertising Services. Our offered, promotion services such as Hoarding Advertising Services, Out Door Advertising Services and Bus Advertising Services are highly acclaimed and liked by the clients. We have acquired expertise in offering the hoarding advertising services, which are specially executed for facilitating the display of advertisements on hoardings. Our offered hoarding advertising services are delivered by the expert professionals of the trade. Further, our offered, outdoor advertising services are rendered for facilitating the advertising on outdoor locations and sites. Our offered outdoor advertising services are delivered by the most experienced professionals of the domain. Additionally, our offered, bus advertising services are carried out for displaying the advertisements on buses. Our offered bus advertising services are rendered by the most experienced professionals and technicians of the trade.